Dill is an attractive plant for both the herb garden and ornamental plantings. 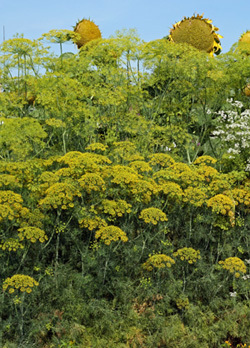 The International Herb Association has named dill as their Herb of the Year 2010. 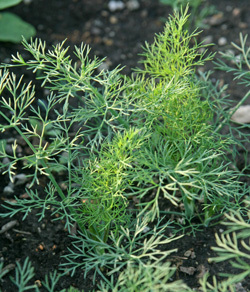 This annual plant with aromatic foliage and seeds, Anethum graveolens, is the sole species in that genus of the parsley family (Apiaceae or Umbelliferae). It is thought to have originated in Eastern Europe, southern Russia, central and southern Asia. It has naturalized in many other parts of the world, and can be seen as a roadside weed in July and August in many parts of the US. Although we know it primarily as a culinary herb, it was used historically for medicinal and magical purposes (love potions, casting spells and for protection against witchcraft). Dill foliage is fine-textured and ferny. 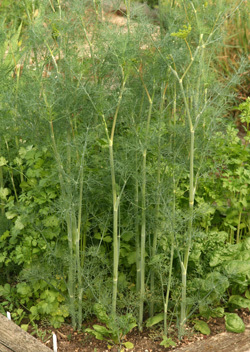 Dill plants grow 18 inches to 4 feet tall and resemble fennel. The soft, alternate, blue-green leaves are finely divided, giving a fern-like appearance. The leaves can be cut anytime after the plant is a few inches high until the seed stalk begins to form. Continually cutting the foliage back will help delay flowering. The plant has a tap root like a carrot. The tiny yellow dill flowers open in a large umbel infloresence. 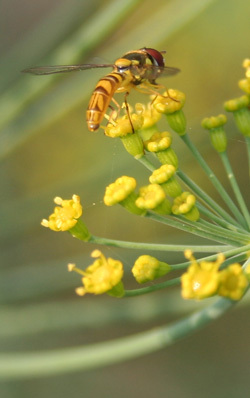 A syrphid or flower fly alights on a dill flower. developed but before they have turned brown. The seed heads can be dried on screens or placed in paper bags and left in a warm, dry place for a week before separating the seeds from the stems. Store the seed in an airtight container in a cool location. Seed is viable for several years if kept dry and cool. The flowers are attractive to small wasps, flies and other insects, including beneficial flower or hover flies (family Syrphidae), the larvae of which eat aphids. e following spring. If the seed heads are not harvested, dill will readily self-seed, too. Transplants can also be used, but because the plants develop so quickly this is not usually necessary to produce a good crop. Seeds will germinate in 10 to 14 days. 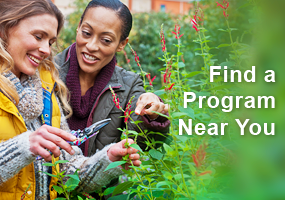 Seedlings should be thinned to 3-6 inches apart when they are 3-4 weeks old. If grown in containers, a deep pot should be used to accommodate the long roots, and the plants may need to be staked, particularly if short varieties are not planted. Even in the garden, tall types can benefit from staking as the hollow stems can be easily damaged by wind, rain, and hail. Dill is not very competitive with other plants, so they should be kept well weeded. Dill has few pest problems other than the occasional aphid infestation or powdery mildew, and is not attractive to deer. However, it is a larval host of the black swallowtail butterfly (Papilio polyxenes). The distinctive black and green-yellow caterpillars can eat a tremendous amount of foliage, and often occur in groups. If there are too many they can be picked off the plants, but most people prefer to let them grow to become butterflies. 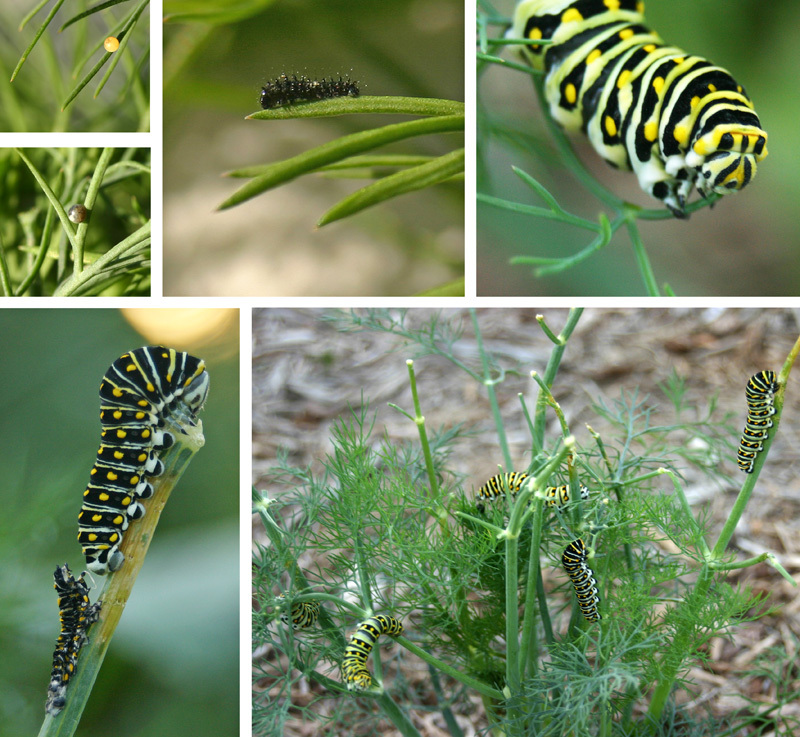 Black swallowtail butterfly: freshly laid egg (top L); egg changes color when ready to hatch (middle L); a newly hatched larva (top C); a nearly mature caterpillar feeds on the foliage (top R); a recently molted caterpillar with shed skin below (bottom L); and a group of black swallowtail larvae defoliate a large dill plant (bottom R). In addition to its use in the herb garden, dill can be an attractive ornamental addition to an annual or mixed border. The finely cut foliage is decorative, while when in flower the plants offer vertical interest. It looks at home in the cottage garden or other informal plantings. ‘Bouquet’ is best for seed production. 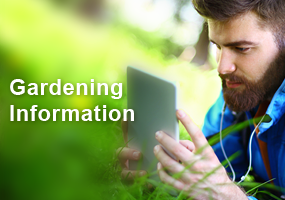 It grows 2-3 feet tall and1½ -2 feet wide with blue-green foliage. ‘Dukat’ is similar to ‘Bouquet’ in size and color but with heavier foliage and later blooming. ‘SuperDukat’ is an improved form. Both have a strong flavor and high oil content. ‘Fernleaf’ is a short variety, good for containers. It has extra finely cut foliage, is slow to bolt, and only gets about 18” tall. ‘Hercules’ is a tall (up to 5 feet in ideal conditions), tetraploid variety bred for foliage production that is slow to bolt. ‘Long Island Mammoth’ has sparser, green foliage, produces large flower heads on multiple stalks, and is considered the best variety for pickling. ‘Vierling’ has blue-green foliage and strong stems, and the flower/seed heads are used commercially as a cut flower. 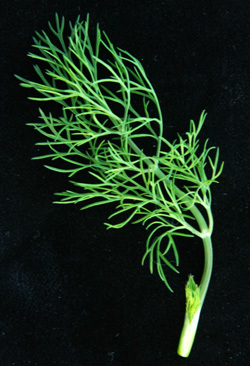 A sprig of fresh dill foliage or dillweed. Both the foliage and the seeds are used for flavoring foods. 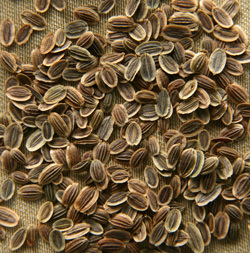 The leaves are often referred to as dill weed to distinguish this from dill seed. The aromatic leaves can be used fresh or dried, although flavor rapidly declines when dried. 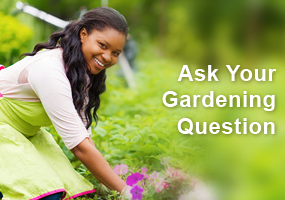 The leaves wilt quickly once picked, but will keep in a plastic bag in the refrigerator for about a week. The leaves can also be frozen (preferably in water), but will turn dark and some flavor will be lost, but not as much as with dried leaves. Seeds can also be used fresh or dried. 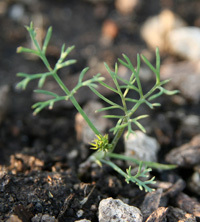 Dill oil can be extracted from all above-ground parts of the plant. Dill is the quintessential herb for flavoring pickles, but this herb can be used in many other ways. It is commonly used in eastern European, Russian and Scandinavian cuisine, as well as certain dishes from the Middle East and India, particularly in Punjab. Fresh chopped leaves may be used as a garnish on fish, incorporated into cream sauces and dips, added to potato salad, or used to flavor herb butter. Season new potatoes with butter, salt, pepper and fresh dill weed; steep the seeds or flowering heads alone or in combination with other herbs to make flavored vinegar for use in salad dressings; add chopped fresh dill foliage to scrambled eggs, deviled eggs or cottage cheese; or try it on steamed vegetables such as beets, carrots, cauliflower or green beans. A classic recipe for cucumbers in sour cream uses fresh dill leaves. In cooked dishes the leaves should be added towards the end as the subtle flavor is greatly reduced when heated. Seeds, however, are often toasted as heating brings out their aroma and flavor.